Can even measure powders and granules, not just liquids. Good linearity for a wide measurement range, not affected by wide temperature drift. 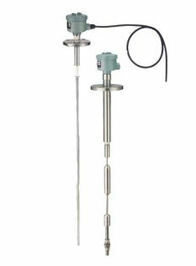 Various electrodes are available including rod electrodes and wire electrodes. An intrinsically safe explosion proof model is also available. Stably outputs signals even at high sensitivity levels. Good noise immunity. Good linearity for a wide measurement range. A shielded cable is used, eliminating dispersion of the capacity of cables between electrode and amplifier. Therefore, the unit is not affected by temperature drift of the cable’s capacity. Therefore, there is no need for a special pressure resistant case as long as the equipment is wired in conformance with explosion proof guideline 2500 (wiring of intrinsically safe circuits) for plant electrical facilities. 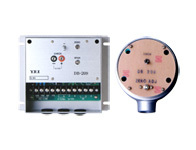 • A 2-line system is employed between the sensor, zener barriers, and power supply. The meter is economical and add to safety. • High zero point precision against temperature change. • A cassette type amplifier is used so it is easy to maintain.